Creeksea Place Barns01621 786503work Group AccommodationCreeksea Place Barns provides luxury holiday accommodation in a beautifully converted Essex barn. Each barn is unique and stylish, and features exposed beams, vaulted ceilings and antique furniture. With a blend of rustic charm and modern comforts, Creeksea Place Barns is the perfect place to stay with friends and family! 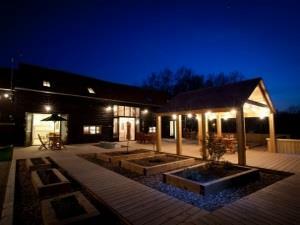 Creeksea Place Barns is located just outside the coastal town of Burnham on Crouch in Essex. The site features a state of the art gym and spa, beauty treatment rooms, a variety of friendly farm animals, a children's play area, a popular cafe, a disc golf course and access to a variety of footpaths. Make your stay extra-special! Treat yourself to a beauty treatment or massage, celebrate a special occasion with afternoon tea, or arrange a special meal with your very own in-house chef! We offer 8 self-catering barns in total, and can accommodate groups of all sizes from 2-30 people. Creeksea Place Barns is within 1 hour of London by direct train, and Burnham on Crouch Golf Club and sailing clubs are just down the road! Creeksea Place Barns provides luxury holiday accommodation in a beautifully converted Essex barn. Each barn is unique and stylish, and features exposed beams, vaulted ceilings and antique furniture. With a blend of rustic charm and modern comforts, Creeksea Place Barns is the perfect place to stay with friends and family!